We were planning on having ham last night, since I had a coupon that expired this week, and I had a vague memory of seeing these potatoes somewhere. It took a little bit of searching, but I should have known something so delicious would be found from The Pioneer Woman Cooks. 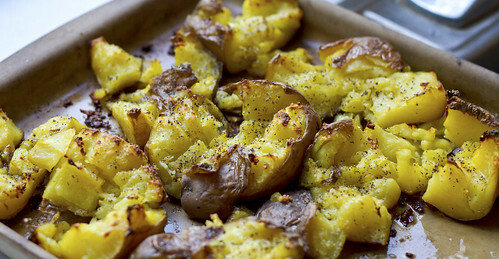 I L-O-V-E potatoes, especially crispy potatoes and these were awesome! Since you boil them first, you don't have to worry about them not being all the way done and they get deliciously crispy. YUM! 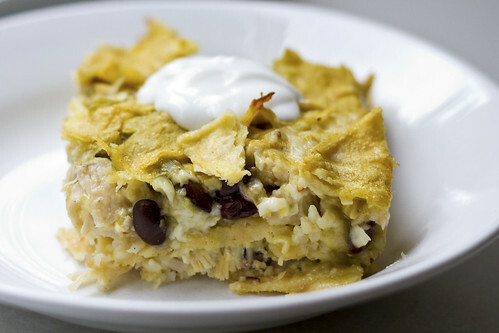 I made these into an enchilada casserole since I was using corn tortillas (they are small and I figured they would just fall apart anyway), but I really loved that everything was in one dish...including the beans and rice. The original "recipe" is below and came from Jamie's Cookbook. Preston had THREE helpings of it...they were small, but still, that is success in my book! Note from Jamie: this is more of an ingredient list with approximations of amount than an exact recipe; how much you need will vary by how much of each ingredient you use in each tortilla. You can sprinkle any extra cheese and onions on top. Or if I use too much cheese in each, I add some cheddar cheese or a jack cheese blend on top. Preheat oven to 350. Layer rice, beans, chicken, onions and cheese in each tortilla and roll. Pour enchilada sauce over tortillas. Bake at least 30 minutes, until hot and bubbly. In my opinion, the longer the better because the onions get tastier the longer they cook. We love any meal that is served on top of rice, so I was excited to try this recipe from Mel's Kitchen Cafe. The meat was so tender and I loved the subtle flavor. It was a hit with the whole family! In a large 12-inch skillet, heat the oil over medium-high heat until it is simmering and hot. Season the pork chops on both sides with salt and pepper. Brown the pork chops for 1-2 minutes on each side in the hot oil until golden. (Mel says this is a MUST!) Transfer the chops to the slow cooker. Add the garlic to the drippings in the skillet and stir constantly over medium heat until the garlic is aromatic and golden (but not burned or it will turn bitter!). Stir in the soy sauce, broth, brown sugar and red pepper flakes; cook and stir until sugar is dissolved. Pour over chops. Cover the slow cooker and cook on low for 7 to 8 hours until the meat is tender. If using bone-in pork chops, fish out the bones from the slow cooker. Remove the chops from the slow cooker to a shallow pan or plate – they will most likely be falling apart in tenderness at this point. In a small bowl, combine the cornstarch and cold water until smooth. Whisk the cornstarch slurry into the sauce in the slow cooker. Return the chops to the slow cooker. Turn the slow cooker heat to high and cook for 30 minutes to an hour longer, until the sauce is slightly thickened. If you want a super duper thick sauce, once you remove the chops from the slow cooker, pour the sauce into a pan and place it over medium heat on the stove. Add the cornstarch slurry and bring the sauce to a boil. Boil for 1-2 minutes until the sauce is thick. Add the pork and heat through. 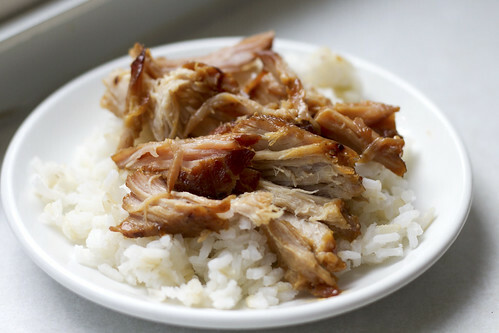 Serve the tender chops over rice and garnish with green onions, if desired. I LOOOOOVED these enchiladas! I didn't have my camera though, so I didn't get a picture of my own, but I will definitely be making them again...and soon! The sauce is creamy and tangy and delicious! Yum! I wish I had more left to eat tonight :-(! Sprinkle the chicken breasts on each side with the salt and black pepper. In a large cast-iron set on medium heat, and cook the chicken breasts on each side for three minutes. Place in the oven and bake for 30 minutes. When the chicken is done, take the chicken out of the oven and let cool. Then shred with two forks. Keep the oven on as you’ll be using it again. While the chicken is baking, in a pot melt the butter. Throw in the diced Serrano chiles and cook until soft, about three or four minutes. Add the minced garlic and cook for another minute. Add the flour and cook for one more minute. Pour the chicken broth into the pot, and whisking constantly cook until chicken broth has thickened. Stir in the sour cream, cumin, cayenne and cilantro. Remove from heat. If using fresh tomatillos, place them under the broiler on a foil-lined sheet and cook on each side until blackened, about four minutes per side. Place in a blender along with the sour cream sauce and puree into smooth. If using canned tomatillos, skip the broiler step and just place them in the blender with the sour cream sauce and proceed. Heat the canola oil in a skillet and cook the corn tortillas on each side a couple of minutes until soft. 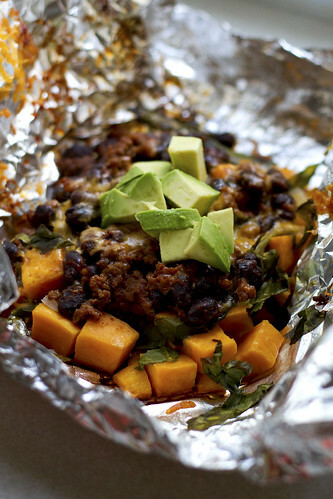 Wrap in a cloth to keep warm as you continue to cook all 12. 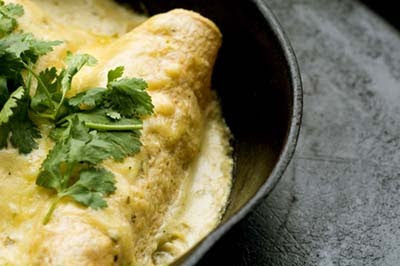 To assemble the enchiladas, pour one cup of the sour cream sauce in the bottom of a casserole pan. Take each corn tortilla and place in the middle 1/3 cup of shredded chicken, 1 teaspoon of diced onions and 1 tablespoon of cheese (approx). Roll the tortillas around the filling and place the rolled tortillas seam side down in the casserole dish. Cover the enchiladas with the remaining sauce and cheese and bake at 350 for 25 minutes or until top is brown and bubbling. Serve topped with chopped cilantro. Makes 12 enchiladas. When I went to Our Best Bites looking for dinner recipes this week, these little rolls were at the top of their site, screaming out at me "Gluten-Free"! I had to try them and I have HAD to make them every night this week...seriously. They are simple, tasty, and like I said, Gluten-Free. YUM! *you can play around with the cheese. I've used Monterey Jack, low-moisture mozarella, swiss, and even gruyere in place of the cheddar. All great! Optional: extra cheese to sprinkle on top and any herbs/flavorings you'd like to add. Try rosemary and or garlic powder. Preheat oven to 400 degrees. Place egg, milk, oil, tapioca flour, and salt in blender and blend until smooth. Add cheeses and pulse 2 times. 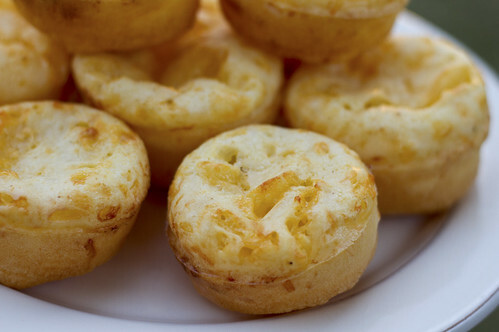 Immediately pour batter into a mini muffin tin (if your muffin tin isn't non-stick, spray lightly with non-stick spray first), filling each well about 3/4 full, or just slightly less. If desired, sprinkle a bit of parmesan cheese on top and/or a tiny sprinkle of kosher salt. Bake for 15-20 minutes until puffed and golden. Remove from oven and cool for a few minutes before removing rolls from pan. Serve warm. These actually don't re-heat well so I recommend making and eating fresh.